This article explains the step-by-step tutorial to Auto-generate & Email Stamps.com USPS labels with ELEX Stamps.com USPS Auto-Generate & Email Labels Add-On. For more information on the plugin, refer to the product page. This Add-On works only with ELEX WooCommerce Stamps.com Shipping Plugin with USPS Postage which allows you to access real-time rates from USPS, print shipping labels, track shipments, and helps in packing items into boxes. This plugin is approved from Stamps.com. You can watch the video tutorial below. Or continue reading the article. Automatically create shipments and generate labels – Once an order moves to the selected status, the add-on creates shipments and generates the shipping labels for each package in the order. Get notified of all shipping labels – The add-on sends an email notification to the shop owner to whenever the order is placed and the shipment is created. You can also choose to notify your customer. 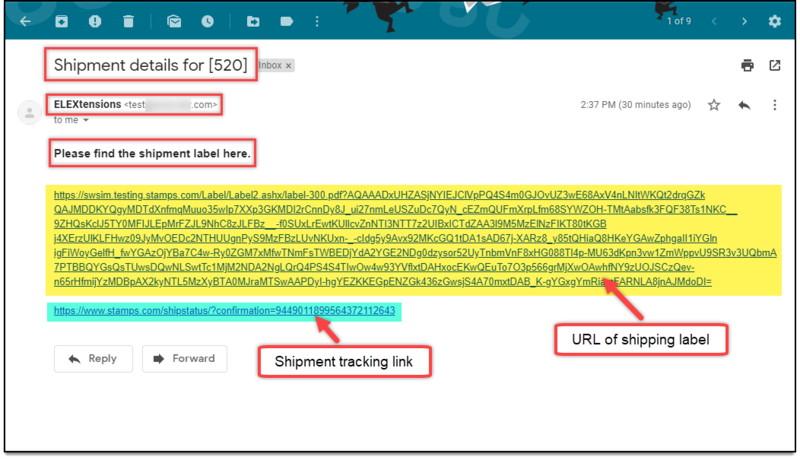 Track shipments – The email notification will also contain a tracking URL that allows the recipient(s) to track the shipments. Get notified when shipment fails – When a shipment fails to create, you can notify shop owners about it. The shop owners can then resolve the issue and create the shipment manually. The core label printing process is determined with the ELEX WooCommerce Stamps.com USPS Shipping Plugin settings and not the add-on settings. Hence you need to set up the ELEX WooCommerce Stamps.com USPS Shipping Plugin first and then proceed with auto-generating of shipping labels. Now that we have explored the features of the add-on, and have installed it, let’s get down to configure it. 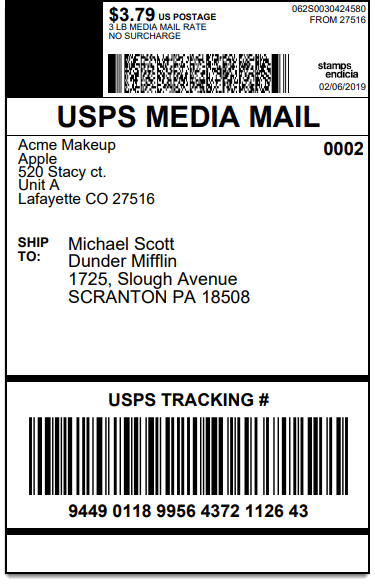 Go to WooCommerce > Shipping > Stamps.com-USPS > Add-on – Auto Generate Labels. Choose the WooCommerce order status(es) from the given drop-down list for which you want to auto-generate shipping labels. When an order moves to one of the selected statuses, the add-on automatically creates a shipment, generates shipping label(s) and sends it to the selected email recipients. If a shipment is already created for order and the order moves to one of the configured order statuses, the add-on will simply fetch the generated label URL and email it to recipients. Email Recipient(s): You can choose to send the auto-generated emails to Customer and Shop owner. You can also select Custom email option and add desired email addresses for custom recipients. Add Email: This setting appears when you select Custom email option for the email recipient. You can enter multiple email addresses by separating them with commas. From Email: The add-on automatically takes the store’s admin email address as the sender email address. You can choose to enter any desired email ID as well. From Name: Enter sender name in this setting. This could your name or the name of your organization. Email Subject: Enter a subject for your emails. If you are sending emails to your customers, you might want to use catchy phrases or terms that describe your business. The respective order IDs will be appended to the subject line automatically. Email Content: Enter your desired content to describe your customers’ order. The label(s) will be appended at the end of the content automatically. There may be instances when a shipment fails to create. For example, the shipping service selected by the customer might fail to return any rates, the customer selects a default shipping method, or third-party shipping service other than the ones offered by the ELEX Stamps.com USPS plugin. Hence in such cases, the add-on will help you notify failure of shipment creation, via email. You can then go back to the respective WooCommerce order, create the shipment and generate the labels manually. The settings are as shown below. Email Notification: Tick this checkbox to enable shipment failed email notification. Email Subject: Enter the desired subject line for your shipment fail emails. The respective order ID will be appended to the subject line. Email Content: Enter desired content for shipment failure notification. Click on the Save Changes button once all settings are configured. 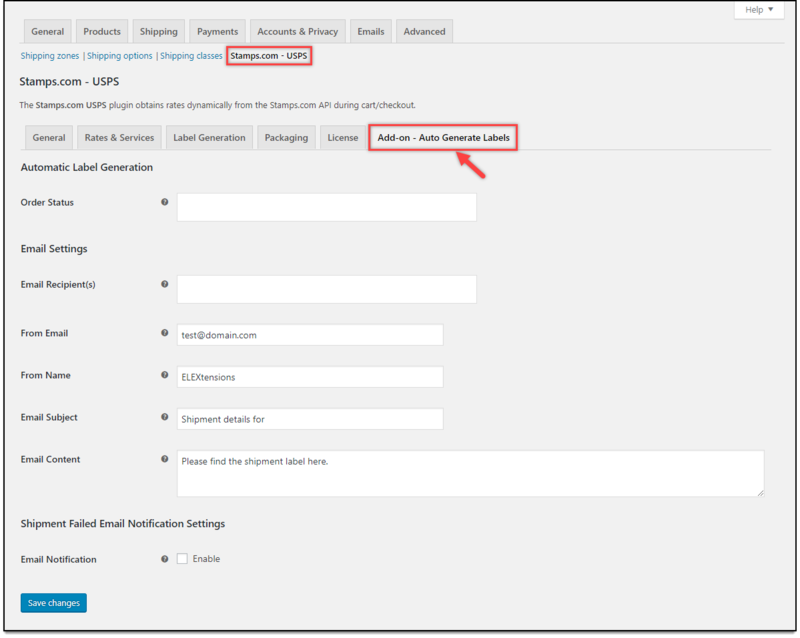 When an order is placed successfully using USPS shipping service, the add-on will automatically create shipments using the ELEX Stamps.com USPS Shipping Plugin and notify the selected email recipient(s). A sample email is as shown in the below screenshot. As shown in the image above, click on the given link to view the shipping label of the respective order. To track the shipment, click the respective shipment URL. Each label will have a separate shipment tracking link. Below is a sample label generated by ELEX Stamps.com USPS Shipping Plugin. In this way, you can auto-generate and email Stamps.com USPS shipping labels with EELEX Stamps.com USPS Auto-Generate & Email Labels Add-On. To explore more details about the plugin, go check out ELEX WooCommerce Stamps.com Bulk Label Printing Add-On. Or check out the main product – ELEX Stamps.com Shipping Plugin with USPS Postage for WooCommerce and its product documentation for a better understanding of the plugin.